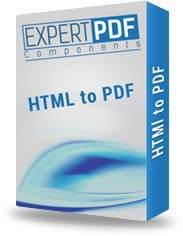 The ExpertPDF HTML to PDF Converter for .NET consists in a .NET library that can be used directly in any .NET application (ASP.NET, Windows Forms, Console, Web Services, Windows Services, etc). The converter does not require any installation and it does not use any printer driver to perform conversion. It's just an assembly that you can directly link with your .NET application. The full HTML / CSS set is supported and the main goal of the converter is to preserve unchanged the original aspect of the converted HTML page. It can be used as general purpose tool for converting web pages and HTML code to PDF or as part of our Reporting Toolkit for .NET to easily create PDF reports directly from ASP.NET pages. If you think that the converted ASP.NET page can contain your preferred server controls like charts, barcodes, data bound control like data grids and repeaters you can realize how powerful this tool can be. The converter API offers methods to convert a web page from a specified URL to PDF or a specified HTML string. Additionally you can convert web pages and HTML code to images in any format supported by .NET framework (BMP, JPEG, PNG, GIF, etc). If you want to get started immediately without reading the next sections of this document this is something perfectly possible. First you have to add a reference to the converter library assembly ephtmltopdf.dll in your .NET or ASP.NET project. Since v9.0, a new dll is needed by the converter (epengine.dll). That needs to be in the same folder with ephtmltopdf.dll, but it does not need a reference in Visual Studio. Further you can save the PDF document bytes into a file on disk or you can send the bytes as a response to the client browser. We provide full sample applications, both in C# and VB.NET to exemplify both situations. The ExpertPDF HTML to PDF Converter for .NET 2.0 is delivered as a zip archive and it doesn't have an installer. You have to unzip the archive in a folder on the disk. Below is a brief description of the folders from the archive. Bin folder contains the .NET 2.0 assemblies you can use in your application and two prebuilt Windows Forms sample applications that you can use to quickly check if the converter can run correctly in your environment. Bin/.NET_4.0 folder contains the .NET 4.0 assemblies you can use in your application and one prebuilt Windows Forms sample application that you can use to quickly check if the converter can run correctly in your environment. ephtmltopdf.dll - is the HTML to PDF converter library that you can link in any .NET application, either Windows Forms or ASP.NET. ephtmltopdf.xml - is the HTML to PDF converter API reference in XML format for Visual Studio IntelliSense. epengine.dll - is the library used by the converter to render web pages. Doc folder contains the HTML to PDF Converter manual and the API reference in chm and html format. Samples folder contains C# and VB.NET full sample applications to offer you ready to use code for ASP.NET, Windows Forms and console applications. Each sample has a solution file .sln that you can directly open in Visual Studio 2005 or in Visual Studio 2008. AspNet_GettingStarted - is an ASP.NET application which shows how to convert web pages and HTML code to PDF and images. The application uses the HTML to PDF Converter library with the default settings. AspNet_InvoicesDemo - is an ASP.NET application which shows how to dynamically generate PDF invoices from a ASP.NET page. The application uses the HTML to PDF Converter library to convert a HTML string to PDF. AspNet_HtmlConvertDemo - is an ASP.NET application which shows how to convert web pages and HTML code to PDF and images. The application uses the HTML to PDF Converter library and shows you how to set various conversion parameters like the headers and footers, page size, page orientation, compression level, etc. HtmlElementsLocationInPdf - is an ASP.NET application which shows how to retrieve the location in PDF of various HTML elements. MultipleHtmlConversions - is an ASP.NET application which shows how to convert many HTML document into the same PDF document. TableOfContentsAndBookmarks - is an ASP.NET application which shows how to automatically create a table of contents in the generated PDF document. RepeatTableHeadOnEachPage - is an ASP.NET application which shows how to automatically repeat the head of a HTML table on each PDF page where the table is rendered..
WinForms_HtmlConverterFeaturesDemo - is a Windows Forms application which shows how to convert web pages and HTML code to PDF and images. The application uses the HTML to PDF Converter library and shows you how to set various conversion parameters like the headers and footers, page size, page orientation, compression level, etc. WinForms_NavigateAndConvertDemo - is a Windows Forms application which shows how to convert web pages and HTML code to PDF while you are navigating in Internet. The application uses the HTML to PDF Converter library. Using this application it is possible to convert pages from websites requiring authentication at application level implemented with a custom login page. WinForms_HtmlInHeaderAndFooter - is a Windows Forms application which shows how to add HTML in header and footer of the rendered PDF document. Here you can also find code to add page numbers in footer. WinForms_PrependAppendExternalPdfs - is a C# Windows Forms application which shows how to convert many URLs into the same PDF document. WinForms_HtmlElementsLocationInPdf - is a C# Windows Forms application which shows how to retrieve the location in PDF of various HTML elements. WinForms_MultipleHtmlConversions - is a C# Windows Forms application which shows how to convert many HTML document into the same PDF document. WinForms_TableOfContentsAndBookmarks - is a C# Windows Forms application which shows how to automatically create a table of contents in the generated PDF document. WinForms_RepeatTableHeadOnEachPage - is a C# Windows Forms application which shows how to automatically repeat the head of a HTML table on each PDF page where the table is rendered. Console_HtmlConvertDemo - is a Console application which shows how to convert web pages and HTML code to PDF and images. The application uses the HTML to PDF Converter library and shows you how to set various conversion parameters like the headers and footers, page size, page orientation, compression level, etc. Console_MultithreadedPerformance - is a Console application which can be used to measure the performance of the converter in a multithreaded environment. The recommended hardware and software resources for successfully running the ExpertPDF HTML to PDF converter for .NET are listed below. Basically this is the environment we used for testing the product. The converter API is fully documented in the Doc/HtmlToPdf.chm . In order to use the converter library you have include the ExpertPdf.HtmlToPdf namespace in your application. The main classes in this namespace is the PdfConverter class and the ImgConverter class which expose the methods you can use to render a PDF document or an image from a URL or a HTML string. Below is a brief description of the main classes and properties of the converter. This class defines a set of methods to render a PDF document from a URL or from a HTML string. The conversion result can be a stream of bytes as byte object or a file on the disk. The PDF bytes can be further saved in a disk file or can be send a HTTP response to the client browser. The method below converts the URL specified as parameter to a PDF document returned as bytes array. The bytes array can be sent to a web browser from an ASP.NET application, saved in a file on disk or into a database or sent by email as an attachment. The correspondent methods you can use to render the PDF document in disk file are listed below. These methods internally use the methods above to get the bytes array and then they simply save the bytes in the specified file on disk. There is also a set of methods returning a Document object that can be used to further modify the generated PDF document as described in the Post Convert Customization of the Generated PDF Document section by adding new PDF pages and new PDF elements to the document. The Document class and the elements that can be added to a Document object are defined in the ExpertPdf.HtmlToPdf.PdfDocument namespace. The generated Document object can be modified and then saved into memory, file or stream using one of the Save methods of the Doocument class. The conversion process and the aspect of the generated PDF document can be configured in many ways. You can set the PDF document page size (A4, A3, etc), orientation (Portrait or Landscape), compression level, encryption and passwords, document info (author, title, subject, etc), add headers and footers with page numbering, etc. The main properties of the converter are listed below. To set the license key you received after purchase and unlock the product you can use the LicenseKey property. If this property is not set with any value the converter will enter in demo mode. The PageWidth and PageHeight properties allows you to set the width and height of the virtual browser windows. The web page content is rendered based on the virtual browser width specified as a integer value in pixels. Setting these properties has the same effect as the effect produced when resizing a web page in a browser window to the specified dimensions. The default value of the PageWidth property is 1024 pixels. The default value of the PageHeight property is 0 pixels which means the height will be automatically determined. These values are producing good results in most of the cases but there are also some situations when you'll have to change these properties. You can also choose to let the converter autodetermine both the width and height of the virtual browser by setting both PageWidth and Page Height properties to 0. The PdfDocumentOptions property allows you to change the aspect and properties of the rendered PDF document like setting the margins, add header and footer, embed true type fonts, generate a document with selectable texts and images or a document with an embedded image, enable or disable live links, pdf page size and page orientation, compression level, show or hide the headers and footers. This property exposes an object of PdfDocumentOptions type which is automatically created in the PdfConverter constructor. Therefore you don't have to set this property directly with a value from your code but you'll have to set the properties of the exposed PdfDocumentOptions object. The main properties of the PdfDocumentOptions class are described in a later section. The PdfSecurityOptions class property allows you to change the permissions of the rendered PDF document like allow or disallow printing, etiding, etc and also to set user and owner passwords. This property exposes an object of PdfSecurityOptions type which is automatically created in the PdfConverter constructor. Therefore you don't have to set this property directly with a value from your code but you'll have to set the properties of the exposed PdfDocumentOptions object. The PdfDocumentInfo property allows you to set the rendered PDF description like title, author, subject, keywords, etc. The PdfHeaderOptions and PdfFooterOptions properties allows you to customize the aspect of the headers and footers added to the rendered PDF document. Note that the header and footer are visible in the resulted PDF document only if the corresponding ShowHeader and ShowFooter properties from the PdfDocumentOptions property are true. These properties expose objects of PdfHeaderOptions type and PdfFooterOptions type which are automatically created in the PdfConverter constructor. Therefore you don't have to set this property directly with a value from your code but you'll have to set the properties of the exposed PdfHeaderOptions and PdfFooterOptions object. The main properties of the PdfHeadersOptions and PdfFooterOptions classes are described in a later section. This class defines a set of methods to render a image from a URL or from a HTML string. The conversion result can be a stream of bytes as byte object or a file on the disk. The image bytes can be further saved in a disk file or can be send a HTTP response to the client browser. The method below retrieves the image bytes from a URL. There is also a similar method which produces an System.Drawing.Image object from a specified URL. The second parameter allows you to specify the format of the resulted image as a value from the System.Drawing.Imaging.ImageFormat enumeration. The URL must be anonymously accessible from the computer running your application otherwise a 'Get web page content cancelled or invalid URL supplied' exception is thrown by the converter. The best way to debug this type of exception is to load the URL in the Internet Explorer browser running on the same machine with your application and see if the page is correctly loaded. You can notice there are similar methods producing a System.Drawing.Image object instead of a byte. The correspondent methods you can use to render the image in disk file are listed below. These methods internally use the methods above to get the bytes array and then they simply save the bytes in the specified file on disk. In the full API reference document you'll notice some other similar methods for converting a HTML stream to image or a HTML file to image file but they are derived from the methods described above and in the most of the cases you won't need them. The conversion process and the aspect of the generated image can be configured with the configuration properties below. The default value of the PageWidth property is 1024 pixels. The default value of the PageHeight property is 0 pixels which means the height will be automatically determined. These values are producing good results in most of the cases but there are also some situations when you'll have to change these properties. You can also choose to let the converter auto determine both the width and height of the virtual browser by setting both PageWidth and Page Height properties to 0. In this section will be described the main features of the converter with code samples for each feature. The dimensions are specified in points and a point is 1/72 inches. The A4 page size in points is 595x842. At a screen resolution of 96 dpi, a A4 PDF page has 794 pixels in width and 1123 pixels in height. You can set the document description like author, title, subject, keyword using the PdfDocumentInfo property. The converter supports the following CSS styles to control the page breaks: page-break-before:always, page-break-after:always and page-break-inside:avoid. For example, with the page-break-after:always style applied to a HTML element (image, text, etc) you instruct the converter to insert a page break right after that element is rendered. By default the converter always tries to avoid breaking the text between PDF pages. You can disable this behavior using the PdfConverter.AvoidTextBreak property. Also you can enable the converter to avoid breaking the images between PDF pages using the PdfConverter.AvoidImageBreak . By default this property is false. Below is an example of using the page-break-inside:avoid style. The table contains a large number of rows, each row containing an image in the left and a text in the right and we don't want a row to span on two pages. The converter can convert any HTTP link from the HTML document into a link in the PDF document. This works on links containing text, image or any other combination supported by the HTML code. This is the default behavior of the converter. If you don't want to get active links in the generated PDF document you can set PdfConverter.PdfDocumentOptions.LiveUrlsEnabled = false. For more details please take a look a the WinForms_ConvertAndMergePdf sample application. The converter can produce PDF documents with pages of any size. The page size is controlled by the PdfConverter.PdfDocumentOptions.PdfPageSize property of type PdfPageSize. You can set this property to standard values like A4,A3,etc or to Custom. In this case the PDF page size will be given by the PdfConverter.PdfDocumentOptions.CustomPdfPageSize property. Below is a sample code for setting the converter to produce PDF pages with the width of 200 points and height of 300 points. A point is 1/72 inch. By default the custom size is set to a width of 595 and a height of 842 points which is the size of the A4 portrait page. When the page orientation is set to landscape the width and height values are inverted. The ClassNameFilter property is case sensitive and the string value set for this property must textually match the class attribute of the HTML tag to be bookmarked. The converter automatically converts the HTML links with anchors found in the HTML document to internal links in PDF. This features can be used to easily create table of contents in the generated PDF document. A HTML link with anchor consists in two HTML elements : a link defined with by a <a href="#target">Internal Link</a> tag and the target of the link defined by a <a name="target">Link Target</a> tag. When the HTML to PDF converter finds this construction it automatically generates an internal link in PDF from "Internal Link" to "Link Target". The generation of internal links can be disabled using the PdfConverter.InternalLinksEnabled = false. There are a few things to ensure in order to get the internal links correctly generated in the PDF document. When converting an URL to PDF the URL must be fully qualified. For example if a website MyWebsite has a default.aspx page with internal links which is automatically served by the web server when the address http://MyWebsite is typed in the web browser address bar, then converting directly the http://MyWebsite url might not produce the correct internal links because the converter is unable to determine the web page automatically served by the web server. Instead, when converting http://MyWebsite/default.aspx the internal links will always be correctly generated. The PdfConverter has a property InternalLinksDocUrl which allows you to specify the fully qualified URL referenced by the internal links before calling the converter method. When converting a HTML string to PDF it is recommended to always pass the baseUrl and internalLinksDocUrl parameters to the method used to convert the HTML string to PDF. The converter automatically compresses the images generated in PDF using the JPEG compression algorithm to highly reduce the size of the generated PDF document. The JPEG compression reduces the quality of the images. When the JPEG compression level is increased the quality of the images in the PDF decreases. The PdfConverter.PdfDocumentOptions.JpegCompressionLevel property defines the current level used for JPEG compression on a scale from 0 to 100. When the compression level is 0 the compression is the worst and the image quality is the best. The default JPEG compression level used by the converter is 10 which offers a good balance between the images quality and the size of the generated PDF document. If you want to obtain the best image quality it is possible to completely disable the JPEG compression of the images by setting the PdfConverter.PdfDocumentOptions.JpegCompressionEnabled to false. This is a very powerful feature of the converter which allows you to obtain the position in the generated PDF document for any HTML element. Knowing the position in the generated PDF document of any element from the HTML document allows you to create bookmarks for elements from the HTML document, create internal links between HTML elements, place texts or images over the HTML elements or assign a digital signature to a certain element from HTML. This feature can accessed using the PdfConverter.HtmlElementsMappingOptions property. This property allows you defined a list with HTML IDs of the HTML elements to for which you want to retrieve position using the HtmlElementIds property or a list with the HTML tag names of the HTML elements for which you want to retrieve position using the HtmlTagNames property. The HtmlElementsMappingOptions property must be set before calling the converter method. The HTML elements mapping is returned in the PdfConverter.HtmlElementsMappingOptions.HtmlElementsMappingResult. The HtmlElementsMapping result is a collection of HtmlElementMapping objects which offers the PDF page index where the element was mapped by the converter and the rectangle where the element was rendered inside that page, the element HTML ID, the element tag name, the element text and the element outer HTML code. A code sample showing how to use this feature to highlight a specified list of HTML elements in the generated PDF document is presented in the Advanced Post Convert Customization of the Generated PDF Document section. This feature is useful for long HTML tables spanning on many PDF pages such that the reader of the document can always know to which column belongs the data in a PDF page. The RepeatHtmlTableOnEachPage sample contains a complete example for this feature. You can have anything in the repeated table head, from text and images to any other HTML code. that can be used to define the HTML elements excluded by ID or by tag name. By default the converter can generate PDF documents in conformance with PDF 1.4 standard. This standard is accepted by Adobe Reader 5.0 and the later versions of the Adobe Reader. Using the PdfConverter.PdfStandardSubset property the converter can be instructed to generate PDF documents in conformance with PDF/A, PDF/X and PDF/SiqQ and standards. These standards impose additional restrictions to the generate document. The PDF/A-1b standard (ISO 19005-1), used for long-term archiving of PDF documents, requires that all the true type fonts used by the document to be embedded in the document, the http links are disabled, the document does not use transparent objects, the document information properties are disabled. PDF/X-1a:2003 standard (ISO 15930-4), used to facilitate graphics exchange, requires that all the true type fonts used by the document to be embedded in the document, the http links are disabled, all the graphics are in CMYK color space, the document does not use transparent objects. PDF/SiqQ is a standard used by Adobe to ensure that a digitally signed document does not contain items that could alter its appearance when viewed in different environments. A PDF/SiqQ compliant document requires that all the true type fonts used by the document to be embedded in the document and the http links to be disabled. By default the converter uses the RGB color space to draw graphics and images. Using the PdfConverter.ColorSpace property it is possible to instruct the converter to use the CMYK or Grayscale color space when the PDF document is rendered. The HTML to PDF Converter allows a very fine control of the PDF rendering process. The default settings of the converter should be acceptable for majority of the situations but sometimes more control and customizations is necessary. This section offers a summary of the main properties of the converter that can be set to control the rendering of the PDF document. After the HTML content is displayed in the virtual display the virtual display content will be transfered into PDF as you would take a picture of the virtual display and put that picture into a PDF document. The PDF documents pages have a fixed size in points. For example, the A4 page with portrait orientation is 595 points in width and 842 points in height. If the virtual display width is more than 595 points then the rendered HTML content would be shrinked to fit the PDF page width and display the whole HTML content in the PDF document. If the virtual display width is less than 595 points then the rendered HTML content will not be resized and will be rendered in the top left corner of the PDF page at real size. The dimension of the A4 portrait page in virtual device pixels is 793x1122 pixels. This means that at a default virtual display width of 1024 pixels the HTML content will be shrunk to fit the PDF page. This is the reason why you can see smaller fonts and images in PDF than they are in the source HTML document. The PdfConverter.ConversionSummary property returns an object populated after the call of one of the render methods described in PdfConverter Render Methods section with a set of data that can be used to display details about the conversion that has just finished or to further customize the generated PDF document as described in the Post Convert Customization of the Generated PDF Document section. The most important properties of the ConversionSummary object are the PdfPageCount which represents the total number of pages rendered by the converter and the RenderedPagesRectangles which gives for each rendered PDF page the bounding rectangle for the content rendered in that page. For example, if you want to add more elements at the end of the generated PDF document after a conversion, you can find where the conversion ended from the last rectangle of the RenderedPagesRectangles array. For this important scenario two explicit properties were also added to the conversion summary: LastPageIndex and LastPageRectangle giving the zero based index of the last redered page and the bounding rectangle of the content rendered in this last page. The converter offers a set of render methods described in Post Convert Customization Overview section returning the internal Document object created by the converter. The object resulted after conversion is an instance of the ExpertPdf.HtmlToPdf.PdfDocument.Document class. This Document object offers access to the collection of pages of PDF document. You can iterate over the document pages, add new pages to the document, append external PDF documents or add new elements like text and images to the document pages. After modification the document can be saved to a file or to a stream using one of the Save methods of the Document class. The chaper Advanced Post Convert Customization of the Generated PDF Document contains a detailed description of the classes and methods available in the ExpertPdf.HtmlToPdf.PdfDocument namespace. The multithreading support was one of the key factors in the design of the HTML to PDF library because most of the applications today are multithreaded applications. An ASP.NET application is a very good example of multithreaded application because at each request a user makes for a web page the ASP.NET subsystem from IIS creates a new thread in the worker process to execute the page and to return the result to the browser. Because many of the web applications today are ASP.NET applications you can easily understand how important is for a library to perform correctly and reliably in a multithreaded environment. The render and save methods of the PdfConverter object can be safely called from multiple threads of an application and all the memory and resources used by the converter are automatically disposed after each conversion. The library was designed and carefully tested to not leak any memory or system resources after a conversion. Because of this the library can be safely used in services running a very long period without interruption and in highly loaded systems. To demonstrate this, we have created the Console_MultithreadedPerformance sample that you can use to test the behavior and the performance of the converter in a multithreaded application. The PdfConverter class offers a set of render methods producing the internal Document object created by the converter. The object resulted after conversion is an instance of the ExpertPdf.HtmlToPdf.PdfDocument.Document class. This Document object offers access to the collection of pages of PDF document. You can iterate over the document pages, add new pages to the document, append external PDF documents or add new elements like text and images to the document pages. After modification the document can be saved to a file or to a stream using one of the Save methods of the Document class. The classes and methods that can be used to customize the generated PDF document are available in the ExpertPdf.HtmlToPdf.PdfDocument namespace. The most important class defined in the in the ExpertPdf.HtmlToPdf.PdfDocument is the Document class. When the Document object is returned by one of the render methods above it already contains the PDF pages generated by the converter from the URL or from the HTML string being converted. The collection of PDF pages can be accessed with Document.Pages property. New pages with the desired size, orientation and margins can be added to the collection of pages and new elements can be added to any page in the collection. Below in this chapter we offer a detailed description of the elements that can be added to a page of the PDF document. You can add a HtmlToPdfElement which makes possible multiple conversions in the same PDF document, a HtmlToImage element which embeds the image of a HTML document into the PDF document, a RtfToPdfElement which embeds a RTF formatted text into the PDF document, you can add new texts and images, shapes, digital signatures, bookmarks, templates, watermarks, file attachments and notes. The coordinates system origin is located in the top left corner. The positive X coordinates go to right and the positive Y coordinates go down like in the .NET Windows Forms graphics. The Document class offers access to the PDF pages collection, PDF fonts collection, bookmarks, templates and viewer preferences. For example you can add a new page to the document pages collection using the AddPage() method, adding a new font to the fonts collection using the AddFont() methodor adding a new template using the AddTemplate() method. A PDF renderer is an object capable of rendering PDF elements into the final PDF document. Currently the HTML to PDF Converter API defines two types of renderers derived from the ElementsRenderer abstract class: the PdfPage class which renders elements in a PDF page and the Template class which renders the elements in a template area repeated on each page of the PDF document. Both renderers are capable to render the same graphic elements types like HTML to PDF converter elements, shape elements texts and images but additionally the PdfPage renderer can render other interactive elements like PDF links, digital signature elements, attachments, text notes that cannot be rendered by a Template renderer. The PdfPage class represents a page in the PDF document. A PdfPage class object can be instantiated using the Document.AddPage() interface. When calling the AddPage() method without parameters a page with the default margins, size and orientation is created. The margins are inherited from the Document.Margins property. The default orientation is portrait when adding the first page to the document or the previous page orientation is inherited if there was a previous page in document. The default size is A4 when adding the first page or the previous page size if there was a previous page in document. However, any of these properties can be specified when using other overloadings of the AddPage() method. The Template class represents a content which is repeated on each page of the PDF document. The templates can be used to create headers and footers, watermarks or any other content that needs to be repeated on each page of the PDF document. A Template can render all the graphic elements (e.g HTML to PDF converter, texts, images, shapes) a PdfPage can render but it cannot render interactive elements like PDF links, attachments, text notes. A Template class object can be instantiated using the Document.AddTemplate() interface. There two logical types of templates in HTML to PDF Converter: predefined templates like header and footer and custom templates. Both predefined and custom are instances of the Template class but the predefined templates dimensions are for example considered when calculating the available client area in a PDF page. The predefined templates are the document header, footer. The predefined templates are automatically docked to the corresponding side of the PDF page. For example the predefined header is automatically docked to the top of the PDF page which means the header location is the top left corner and the width of the header template is the width of the page. Also if a predefined header was set, the available client area in PDF page will start right under the header. Similar, if a predefined footer was set, it will be docked to the bottom of page and the available client area in PDF will end right above the footer template. It is recommended to set the predefined templates before starting to add elements to the document. The HTML to PDF Converter API allows you to access the headers and footers for of the PDF document created by the converter for customizations but it doesn't allow you to change the header or footer template. The headers and footers can be created using the PdfConverter class interface. A PDF page element represents anything that can be added to a renderer and it implements the PageElement abstract class. The HTML to PDF Converter defines two types of page elements: graphic elements that are inheriting the PageGraphicElement class and interactive page elements inheriting directly the PageElement class. The graphic elements have common properties like fore color, back color, transparency, rotation angle. Examples of graphic elements are HTML to PDF Converter element, RTF to PDF Converter element, text element, image element, shapes elements. Examples of interactive page elements are internal link element, url link element, text note element, file attachment element. Rotate(rotateAngle) - this method is used to rotate clockwise the coordinates system with a specified angle before rendering the graphic element. Transparency - this property is used to set the graphic element transparency. It is expected a value between 0 and 100 for the transparency. 0 means completely transparent and 100 means completely opaque. LineStyle - property is used to set the line width, dash style, line join style, line cap style for the graphic elements rendering lines like rectangle element, ellipse element, line element. In the next sections each of the graphic elements will be described in detail. The integrated HTML to PDF Converter is implemented by the HtmlToPdfElement graphic element. It offers the possibility to specify the position and the size of the PDF content rendered from HTML and the possibility to add many HTML to PDF conversions to same document. A very useful feature is the possibility to know the size of the rendered content in each page when the rendered content spans on many pages. The information about the last rendered page can be taken from the AddElementResult object returned after adding the element to a renderer like a page or template. The variours constructor parameters are explined below. The first constructor creates a URL to PDF converter element at the specified x and y coordinates with the specified width and height. The virtual browser width and height in pixels are specified by the htmlViewerWidth and htmlViewerHeight parameters. height - The destination height in points for the rendered content. If the specified height is negative, the destination height will be auto determined so all the content can be rendered. Please note that the specified height is the effective height that will be rendered in the PDF document and does not include for example the empty spaces introduced by custom or automatic page breaks. htmlViewerWidth - The virtual browser width in pixels. The default value is 1024 pixels. The effect of this parameter is similar with viewing the HTML page in a browser window with the specified width. When this parameter is negative, the converter will try to auto-determine the HTML page width from the HTML body element width. htmlViewerHeight - The virtual browser height in pixels. The default value is 0 which means the height will be auto-determined. The effect of this parameter is similar with viewing the HTML page in a browser window with the specified width and height. When this paramter is negative, the converter will try to auto-determine the HTML page height from the HTML body element height. The second constructor creates a HTML string to PDF converter element at the specified x and y coordinates with the specified width and height. The virtual browser width and height in pixels is specified by the htmlViewerWidth and htmlViewerHeight parameters. htmlStringToConvert - The HTML string convert to PDF. htmlStringBaseURL - The full URL of the page from where this string was taken used to resolve the images and CSS files referenced by a relative URL in the HTML string. This parameter is optional and the default value is NULL. When this parameter is NULL no base URL will be used. This paramter has effect only if the specified HTML string contains a HEAD element <base href="baseURL" />. The converter can convert any HTTP link from the HTML document into a link in the PDF document. This works on links containing text, image or any other combination supported by the HTML code. This is the default behavior of the converter. If you don't want to get active links in the generated PDF document you can set HtmlToPdfElement.LiveUrlsEnabled = false. The generation of internal links can be disabled using the HtmlToPdfElement.InternalLinksEnabled = false. There are a few things to ensure in order to get the internal links correctly generated in the PDF document. When converting an URL to PDF the URL must be fully qualified. For example if a website MyWebsite has a default.aspx page with internal links which is automatically served by the web server when the address http://MyWebsite is typed in the web browser address bar, then converting directly the http://MyWebsite url might not produce the correct internal links because the converter is unable to determine the web page automatically served by the web server. Instead, when converting http://MyWebsite/default.aspx the internal links will always be correctly generated. The HtmlToPdfElement has an optional internalLinksDocUrl parameter in constructor which allows you to specify the fully qualified URL referenced by the internal links before adding the HtmlToPdfElement to a PDF page. When converting a HTML string to PDF it is recommended to always use the htmlStringBaseUrl and internalLinksDocUrl parameters when the HtmlToPdfElement is constructed in order to correctly get the internal links in the generated PDF document. This feature can accessed using the HtmlToPdfElement.HtmlElementsMappingOptions property. This property allows you defined a list with HTML IDs of the HTML elements to for which you want to retrieve position using the HtmlElementIds property or a list with the HTML tag names of the HTML elements for which you want to retrieve position using the HtmlTagNames property. The HtmlElementsMappingOptions property must be set before adding the HtmlToPdfElement to a PDF page. The HTML elements mapping is returned in the HtmlToPdfElement.HtmlElementsMappingOptions.HtmlElementsMappingResult. The HtmlElementsMapping result is a collection of HtmlElementMapping object which offers the PDF page index where the element was mapped by the converter and the rectangle where the element was rendered inside that page, the element HTML ID, the element tag name, the element text and the element outer HTML code. The integrated HTML to Image Converter is implemented by the HtmlToImageElement graphic element. It basically includes the functionality of the HTML to PDF Converter product when converting to a PDF with embedded image and additionally offers the possibility to specify the position and the size of the rendered image and the possibility to add many HTML to Image conversions to same document. The various constructor parameters are explained below. The first constructor creates a URL to Image converter element at the specified x and y coordinates with the specified width and height. The virtual browser width and height in pixels are specified by the htmlViewerWidth and htmlViewerHeight parameters. The second constructor creates a HTML string to Image converter element at the specified x and y coordinates with the specified width and height. The virtual browser width and height in pixels is specified by the htmlViewerWidth and htmlViewerHeight parameters. The integrated RTF to PDF Converter is implemented by the RtfToPdfElement graphic element. It basically includes the functionality of the RTF to PDF Converter product and additionally offers the possibility to specify the position and the size of the rendered content and the possibility to add many RTF to PDF conversions to same document. The constructor creates a RTF to PDF Converter element at the specified x and y coordinates with the specified width and height. The virtual viewer width and height in pixels are specified by the rtfViewerWidth and rtfViewerHeight parameters. rtfViewerWidth - The RTF viewer width in pixels. The default value is 800 pixels. The effect of this parameter is similar with viewing the RTF viewer window with the specified width. When this parameter is negative, the converter will try to auto-determine the RTF document width. rtfViewerHeight - The RTF viewerheight in pixels. The default value is 0 which means the height will be auto-determined. The effect of this parameter is similar with viewing the RTF document in a viewer window with the specified width and height. When this parameter is negative, the converter will try to auto-determine the RTF document height. The constructor creates a paginable text element that will be rendered in the specified rectangle using the specified width, height, font and color. If the text pagination is not allowed ( Paginate property of the TextElement is false ), the text will be written on current page, the rendered text height being given by the minimum between the specified height and the available height on page. The remaining text and the text bounds inside the current page are returned in the AddTextElementResult object when the element is added to a renderer. If the text pagination is allowed ( Paginate property of the TextElement is true ) and the text needs pagination (the specified height is bigger than the available space on page), the height parameter will be ignored and the text will be rendered to the end using the necessary height. The text bounds inside the last page and the last page index are returned in the AddTextElementResult object when the element is added to a renderer. If the text pagination is allowed but the text does not need pagination (the specified height is less than the available space on page), the rendered text will be truncated to fit the specified height. The text bounds inside the current page and the last page index are returned in the AddTextElementResult object when the element is added to a renderer. The first constructor creates an ImageElement from the specified file that will be rendered at the position (x,y) with the (destWidth,destHeight) size. The second constructor creates an ImageElement from the specified System.Drawing.Image object that will be rendered at the position (x,y) with the (destWidth,destHeight) size. The HTML to PDF Converter defines the following shape elements: LineElement, RectangleElement, EllipseElement, EllipseArcElement, EllipseSliceElement, BezierCurveElement, PolygonElement. The page interactive elements inherit directly from the PageElement class. They add interactive features to the PDF document like internal and URL links, file attachments and links, popup text notes, digital signatures, etc. Digital signatures can be added to a PDF document using the DigitalSignatureElement. Adding a digital signature requires a PKCS#12 certificate provided as a .pfx or a .p12 file. The HTML to PDF Converter also defines the following interactive elements that can be added to a page: LinkUrlElement, InternalLinkElement, SoundLinkElement, FileLinkElement, FileAttachmentElement, TextNoteElement that can be used to add interactive features to the PDF document. A unique license key string is generated for each purchase. In order to unlock the HTML to PDF Converter product you have to set the LicenseKey property of the PdfConverter class (when converting to PDF) or of the ImgConverter class (when converting to image) with the license key string you have received after the product purchase. The license key contains the information about the purchased product like the product version and license type and is uniquely associated with an order ID. More details about the license types and pricing can be found on the Buy Now page of our website.